Deep in the ground of the African continent lies a wealth of minerals, metals, and gems. But few African countries—and few Africans—receive the benefits of these resources. The lack of technology and investment money have limited mining operations, and not all countries have significant resources. However, even countries with major deposits have seen most of the profits go to foreign corporations or small groups of privileged Africans. Meanwhile, mine workers labor under harsh conditions for little pay. The explanation for Africa’s abundant resources and limited benefits begins with the European quest for riches in colonial times and continues with the modern plague of corruption. Africa’s mineral wealth takes many forms thanks to its long history of geology—the activities of mountains, rivers, volcanoes, lakes, and forests. Ancient woodlands have been transformed over millions of years into fossil fuels such as petroleum, natural gas, and coal. The courses of rivers and the upheavals of landforms have produced deposits of metals such as uranium, iron, copper, zinc, and tin, as well as rock minerals such as phosphates. Africa’s rocks, soil, and volcanic activity are the source of some of the world’s greatest treasures—from gold and platinum to diamonds of all sizes. Unfortunately, mining operations have also damaged the environments that yielded these resources. Although abundant, Africa’s mineral resources are not evenly distributed. North Africa’s reserves of petroleum and iron ore may run out in a few decades. In sub-Saharan Africa, metals and minerals are concentrated in a few major areas, and about half of the region’s mineral production comes from two countries: SOUTH AFRICA with its gold and diamonds and NIGERIA with petroleum. Africa produces petroleum for the global market. ALGERIA and LIBYA together possess about 3 percent of the world’s known petroleum reserves, and North Africa earns much of its foreign income from its petroleum and natural gas. However, the continent’s largest petroleum producer is the West African country of Nigeria. Coal deposits exist in limited quantities in MOROCCO and in large reserves in the sub-Saharan nations of MOZAMBIQUE, MALAWI, TANZANIA, ZIMBABWE, and South Africa. North Africa’s nonpetroleum resources are fairly limited. The region’s deposits of iron ore have been greatly reduced over the last 2,000 years, but small deposits remain of lead, zinc, manganese, copper, and other metals. Industrial metals are a major industry in some African countries, making them key players in the global economy. ZAMBIA and CONGO (KINSHASA) produce more than half of the world’s cobalt and a significant amount of its copper. Other leading suppliers of industrial metals include GUINEA and GHANA, of the aluminum ore bauxite; Zimbabwe, of asbestos; and GABON, of manganese. Uranium—an essential ingredient in nuclear reactors and weapons—is also produced in Africa, mainly by Gabon, NAMIBIA, and NIGER. Rock minerals are another major African resource. Phosphates, a mineral used to manufacture detergents and fertilizers, come from Morocco, TUNISIA, and elsewhere. North Africa also contains abundant deposits of limestone used in cement. More than half of all the world’s diamonds and platinum are mined in Africa. South Africa’s vast gold field, the Witwatersrand, is rivaled by important deposits in Ghana, ETHIOPIA, and Zimbabwe. South Africa’s diamond mines are world famous, but major diamond deposits exist in ANGOLA, Guinea, BOTSWANA, Tanzania, and Congo (Kinshasa) as well. Mining has a long history in Africa. In North Africa, people have mined for iron ores and other metals for more than 2,000 years. 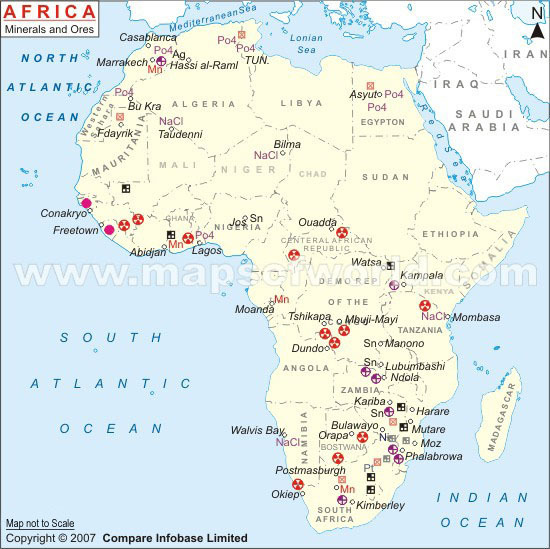 Iron mining began in sub-Saharan Africa by around 500 B.C. and had spread through the region by the A.D. 200s. Iron played a crucial role in the improvement of agricultural tools and weapons. During the colonial period, Europeans eager to profit from Africa’s mineral wealth made developing mining a priority. Since the 1950s and 1960s, when most African states won their independence from Europe, mining has remained an important but troubled part of the national economies. The ancient Egyptians, and later the Romans, launched substantial mining operations in North Africa thousands of years ago. Between the A.D. 700s and 1500s, gold mining provided the major item of trade in the former western African kingdoms of Ghana, MALI, and Songhai. In eastern Africa, the ancient civilization of MEROË (in present-day SUDAN) mined iron ore. Later, gold from what is now Zimbabwe was shipped across the Indian Ocean to Arabia and India, and inhabitants of central Africa mined copper long before the arrival of Europeans. Mining in these early periods had different forms and meanings than it would later have. With limited technology, Africans could not dig deep into the earth and could only exploit fairly shallow deposits. They also had no way of emptying water from mines filled with groundwater. When Africans reached the limits of their skills, they had to abandon mines. Mining took place only in the dry seasons. In addition, mining had an almost sacred meaning. Many groups had rituals, ceremonies, and taboos surrounding these resources and the process of bringing them out of the earth. The fabled gold mines of south-central Africa lured Portuguese explorers into the continent’s interior in the late 1400s and 1500s. But the Portuguese failed to establish any effective mining operations, and by the 1700s most European colonizers preferred making their money in the SLAVE TRADE. By the 1880s, however, Europeans were involved in a frantic race to conquer all of Africa and to exploit its natural riches. Surveyors in South Africa had found astonishing sources of copper in 1854, diamonds in 1867, and gold in the 1880s. For the next few decades, Europeans established mines throughout Africa. In south-central Africa, a chain of major copper mines stretched from what is now Zambia to present-day Congo (Kinshasa). In western Africa miners produced diamonds and gold in Ghana and SIERRA LEONE, and tin and coal were found in Nigeria. Mining supported many colonial African economies, but the profits went back to the mining industry and its owners. European corporations invested their money mainly in mining, ignoring the development of transportation or other infrastructure except to exploit mining. Meanwhile, the people who worked in the mines suffered severe hardships and upheavals. Many thousands of rural Africans left their families and moved into large settlements owned by the companies. Together with white workers, their movements and behaviors were strictly controlled. Even after slavery was abolished, the companies subtracted the costs of rent, equipment, and other expenses from workers’ wages—little remained. Furthermore, accidents and diseases killed and injured workers at a frightening rate, leading to many major labor strikes. The companies responded in some cases by raising the white workers to supervisory jobs with higher pay, separating them from the black workers and fueling racial prejudice. The impact of colonial control on the mining industry continued after African nations won independence in the mid-1900s. Mines and miners kept working and producing. However, now European owners often granted a share of the profits, as well as taxes, to African governments. In some nations, the new governments seized ownership of the mines. But the results were often disastrous. The industries suffered from poor management, lack of investment money, low selling prices, political turmoil, outdated machinery, and general neglect. Labor disputes remained common. As African economies faltered in the 1970s and 1980s, their governments fell in debt to Western banks and international institutions such as the World Bank and the International Monetary Fund. These bodies pressured African nations to sell their mines and other industries to private investors, mainly international corporations. Several other factors limited the profitability of African mining in the late 1900s. For the most part, the continent’s raw ores are exported to other countries for manufacturing. The ores sell for much less than the goods made from them. Furthermore, changes in industrial processes worldwide have reduced the demand for copper, iron ore, and other metals. In Africa, the mining industry continues to be poorly connected to other industries and methods of transportation. In addition, diamond smuggling is widespread in illegal markets, drawing taxes and other profits away from African governments and companies.